At "Unplugging" events, participants will put their cell phones in "sleeping bags" for the evening. New York (CNN) -- As the story goes, God spent six days creating the world and then rested on the seventh day. He told the Jewish people to always rest on the seventh day of each week, which was to become known as the Sabbath for them for eternity. This was before Facebook, Twitter, BlackBerries and iPhones, of course. Adam and Eve didn't have friends who would get upset if texts weren't returned promptly, parents who wanted to know where their children were all the time or bosses who had complete access to their employees via work-issued devices. There is no excuse good enough to ignore the boss, even on a weekend. But one group is trying to take back the Sabbath: Reboot -- a nonprofit organization aimed at reinventing the traditions and rituals of Judaism for today's secular Jews. Composed of Internet entrepreneurs, creators of award-winning television shows, community organizers and nonprofit leaders, these "Rebooters" are people who typically have their cell phones glued to their palms. Several of them go so far as to say they have an addiction to their devices. They pledged to observe 24 hours of freedom from their devices this past weekend: a National Day of Unplugging, lasting from sundown Friday to sundown Saturday, the Jewish Sabbath. 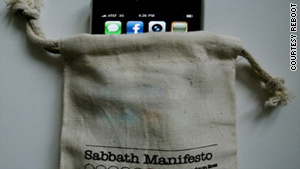 The day was to launch Reboot's ongoing project, the Sabbath Manifesto. Dan Rollman, a Rebooter and founder of the Universal World Record Database Web site, created the Sabbath Manifesto because he felt that technology was taking over too much of his life. "There's clearly a social problem when we're interacting more with digital interfaces than our fellow human beings," Rollman said in an e-mail to CNN. "Rich, engaging conversations are harder to come by than they were a few years ago. Our attention spans are silently evaporating." The National Day of Unplugging specifically promotes the first principle. Even though Reboot is technically focused on reaching out to hyper-connected Jews, the values behind the Sabbath Manifesto are meant for all denominations, Rollman said. "We believe that everyone can benefit from a respite from the relentless technology. Unplugging on a weekly basis won't provide a magical solution to these issues, but it's a start ... a chance to catch our breaths, replenish our souls and reconnect with the living, breathing people we love." It may sound like a nice idea, but how realistic is the concept? Can people live without their beloved technology for 24 hours? "No," said Chris Maroudis, 22, without missing a beat. "The problem is, I live in Jersey and work here [Manhattan]. I have to contact my friends in Jersey to make plans. I'm not just going to go all the way there and then they're not home." Some people are able to remember a simpler time before cell phones. "This is new for me," said 26-year-old Amanda Norman, laughing and waving her BlackBerry. "I remember even before cell phones, when you had to make plans with someone beforehand and meet them there. If you were late, you were late." Walking around Manhattan, though, it is hard to find people without a phone of any kind in their grasp. As Nano Paulino, 27, pointed out, everyone in the city is working. The bosses need to stay in touch with you. Asked if he would answer a call from his boss at 10 at night, he said no. Why not? "I'm sleeping!" His friend, Arnold Diaz, 30, would also have a hard time without his phone, but for a slightly different reason. "Definitely not on a Friday night. We have to make plans. Maybe on a Monday or Tuesday," he paused. "Not Monday, because if you meet a girl over the weekend, you want to call her on Monday. So maybe Tuesday or Wednesday." There is one piece of irony to the whole thing. Lisa Keller, 42, said she can easily go a day without using her phone. Asked if her friends and family would get frustrated by not being able to call or e-mail her, she laughed. "I would first put up a Facebook status to say I'll be off my phone and computer for 24 hours." Reboot also recognizes the irony that it has been promoting the National Day of Unplugging largely using social-networking sites. However, the group was asking people not to log on to their sites in the 24-hour window starting Friday evening at sundown.